When smartphones are in the hands of a billion customers, that’s not just a trend. That’s a moment that requires a huge rethink in how companies do business and build products. That’s the upshot of a new study by Forrester Research, which looks at the trends in mobile and their implications as CIOs and businesses adapt to this new form of personal engagement with users via mobile devices. Forrester forecast that one out of every three dollars spent in the tech economy will be mobile by 2016. 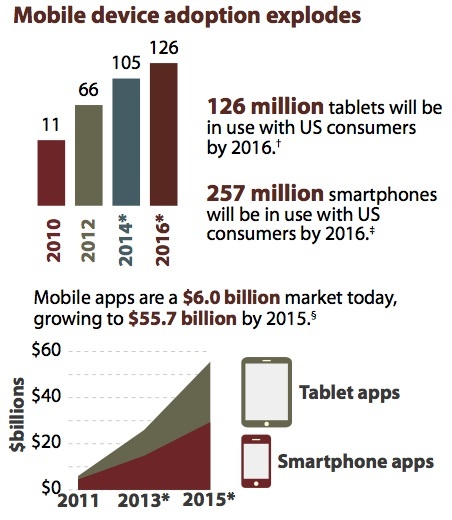 1 billion consumers will own smartphones by 2016, with U.S. users owning 257 million smartphones and 126 million tablets. By 2016, 350 million employees will use smartphones, with 200 million of them bringing their own. Apple (s aapl), Google (s goog) and Microsoft (s msft) are expected to control 91 percent of the U.S. smartphone market and 98 percent of the U.S. tablet market by 2016. Forrester says companies need to realize that mobile apps serve as a new front end for engagement systems. Apps are increasingly context aware, fed by the cloud, sensors, history and social data. That requires companies to reconsider how they deploy apps for customers, partners and employees around this enhanced form of engagement. Mobile apps from companies can’t just log data; they need to harness all the power of mobile and social to help people get specific jobs done in a particular context, connect with people and access information at the exact time they are making decisions. This opens up opportunities but also creates unintended consequences. Forrester said companies must consider how the addition of mobile creates multichannel complications that need to be resolved. Companies must also look at how their middleware and servers are set up to handle the growth in mobile. And they also need to recognize the way consumers interact on mobile and look at building for a particular mobile experience, not just porting over data. To stay ahead of these challenges, Forrester recommends that companies install a chief mobility officer (CMOO) to help corral, plan and manage all the different mobile apps and initiatives undertaken by a business. The CMOO should create a mobile design guide that lays out the goals and practices for a company, focusing on mobile-first design, user experience and rapid, agile development processes. The CMOO will also have to oversee the company’s mobile architecture, looking at which technologies to leverage, how to lead the shift to cloud solutions and manage mobile partners and channels. Companies are already seeing a return on their investment in mobile, which can boost customer engagement and satisfaction and make companies more productive and efficient. 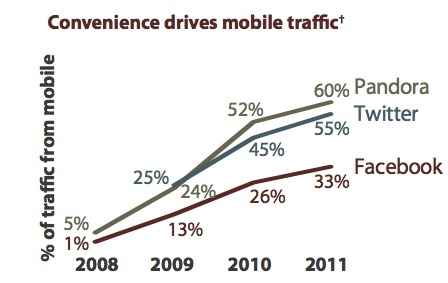 According to Forrester, Walgreens had 25 percent of its transactions come from its mobile app. Insurance company Aflac reported that the equivalent of 25 million customer calls have been handled through its mobile app by agents sitting in their client’s office. If you can get a chance, take a look at the Forrester report. It’s got fuller recommendations for companies looking to weather the transition to mobile. Some of the recommendations aren’t fit for every company, but I think the larger message is true: mobile is a game changer, and companies need to think about how to harness the power of smartphones and tablets. As Forrester points out, the PC forced an organizational shift in companies, and mobile will also require a “reinvention” of IT as well. Great article! I believe Mobile Apps will eventually become a necessity for businesses of all sizes with all budgets. And you no longer need to hire developers to create your apps. it is now literally as easy as making a powerpoint document. With viziapps platform, you dont need to know anything about coding. This is the first and only platform that lets you access back-end data to and from your device, including Google Spreadsheets, without coding. Create your own app and test it on your phone for free: http://www.viziapps.com/LearnMore.aspx This technology fits every budget. this is going to change how small-medium businesses employ their marketing strategies. mobile app technologies gives small businesses a fighting chance to compete with the big players. Mobile computing is rising faster than ever. I wonder where the saturation will take place.